It looks insulting - but what exactly does it mean? It is never a good idea to make rude gestures in parliament. Especially if you are a member of the cabinet. Angry and frustrated during an important debate, Portuguese Economy Minister Manuel Pinho decided to show an opposition MP exactly what he thought of him. He put his hands to his head and pointed at him with his thumbs and index fingers outstretched. In Portugal, and many other countries, it was a highly insulting gesture. It implied that the opposition MP was a cuckold. But what exactly is a cuckold? The word derives from old French for a cuckoo ("cucu"). The females of some species of cuckoo lay their eggs in other birds' nests and leave them to bring up the offspring. So, with that whiff of unfaithfulness, the carefree bird gave us the word "cuckold", which came in the Middle Ages to mean a husband with an errant wife. But there are more subtleties in that rude gesture. The word "cuckold" also implies that the husband is unaware of his wife's infidelities. And he might only find out on the arrival of a baby - palpably not his. Which takes us back to the cuckoo. References to cuckolds abound in English literature. In centuries past, marital infidelity was good for laughs. Such as in Chaucer's The Miller's Tale, in which a young suitor comes up with the most convoluted scheme to entice his young lover away from her suspicious, elderly husband. "For she was wild and young, and he was old, And deemed himself as like to be a cuckold." Shakespeare loved cuckolds - many of his characters suspected they had become one. Cue anger, jealousy, murder and, of course, comedy. The word was also an excellent insult... "crooked-pated old cuckoldy ram" is one of the more colourful. But that gesture - the hands to the forehead, finger and thumb outstretched. How has that become to mean "you are a cuckold"? There are dozens of explanations. One of the earliest comes from the Roman era. Back then, returning soldiers were given horns, symbolising success on the battlefield. But the horns also came to imply failure in the bedroom, and that it was never a good idea to leave a Roman wife alone for too long. A more common explanation is that a horned beast cannot see its own horns. And husbands are often the last to know about their partner's infidelities. Whatever its origins, the link between horns and infidelity remains deep-rooted. But in some countries that gesture made by Mr Pinho it is a lot more insulting than in others. In Britain, the word "cuckold" is old-fashioned. But youngsters still love to stick their fingers up behind their friends' heads in photographs, to make them look silly. But in the Caucasus, any sort of "you have horns" gesture is staggeringly offensive, and can only be answered by violence. In Italy, it is a very common gesture. Although it is definitely not polite, it does not usually end in a duel at dawn. The BBC's Rome correspondent, David Willey, who has lived in Italy for many years, says making the horn-gesture - "fare le corne" in Italian - is understood throughout the Mediterranean. "People here like expressing themselves with lots of body language, as well as verbally," he says. "For example, there is a whole lexicon of hand gestures in Sicily, with a huge range of meaning." 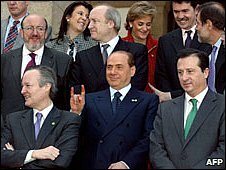 Italian Prime Minister Silvio Berlusconi, always the joker, was caught on camera making a variant of the Portuguese horn-gesture behind the Spanish Foreign Minister, Josep Pique, in an official EU photograph of 2002. Afterwards, he said he was "just kidding". Whatever, it does appear that men in the more macho Mediterranean and Latin countries are more likely to be riled by the gesture. Francisco Almeida Leite, the political editor of the daily newspaper Diario de Noticias in Lisbon, agrees: "This is a Latin country. If you say to someone, your wife did this, it is humiliating. "It is a great thing to do if you want to start a fight." But he points out that in Portugal, the horn-gesture had another meaning, which comes from bull-fighting. At times, the matador almost makes fun of the bull, pulling it this way and that with a swish of his red cape. So, says Mr Almeida Leite, Mr Pinho's gesture implied that his opponent was a lightweight, whose arguments were not worthy of consideration. Whatever the meaning, it was not acceptable behaviour in the Portuguese parliament. Mr Pinho has been replaced by Fernando Teixeira dos Santos. In the Eleme culture, raising the back of your hand with the forefinger and second finger up in the air at another person is an absolute sign of contempt. It means the other person is worthles; a jerk. In Georgia, the Caucasus, being horned has another meaning as well, i.e. being a stupid, uneducated, unrefined, and maybe also a provincial. In Poland the American single finger is gaining in use (especially by the ladies!). The traditional Polish gesture though is the so-called Kozakiewicz, named for the athlete who did it to the Moscow Olympics stadium audience after their continuous booing of his gold medal pole vault winning performance: The left arm is bent across the body and the right goes under and up past it with an aggressive clenched fist. It has the same meaning as the traditional English two fingers. Among the Mendes or Sherbros of Sierra Leone in West Africa, it is insulting to call an adult with one finger. One finger call is for children. In my country, to make the lifting leg, as if to suggest a farting, is inappropriate gesture. Also a rubbing of fingers on the bottom and waving as if to say "I fill the air with my private aroma." Unacceptable, both.